You can add a to-do item to your Calendar. You can also create to do items from the Dashboard List View. Click the To Do tab . In the Title field , enter a title for the To Do . The Date field defaults to the current date . 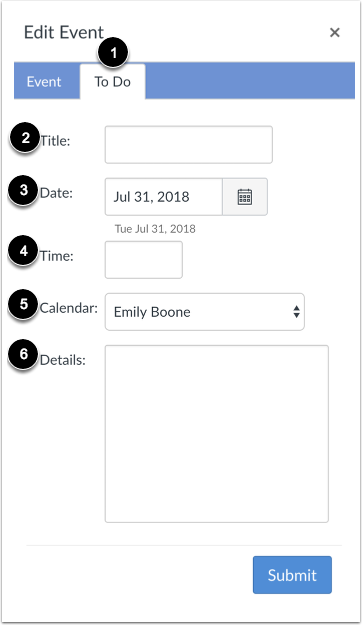 To change the date when you want to complete the item, type the new date or select a date by selecting the Calendar icon. If you want to set a specific time for the item, enter the time in the Time field . If no time is entered, the Time field defaults to 11:59pm. The To Do will associate with your personal calendar by default if your calendar is selected in the sidebar. You can also associate a To Do with a specific course. 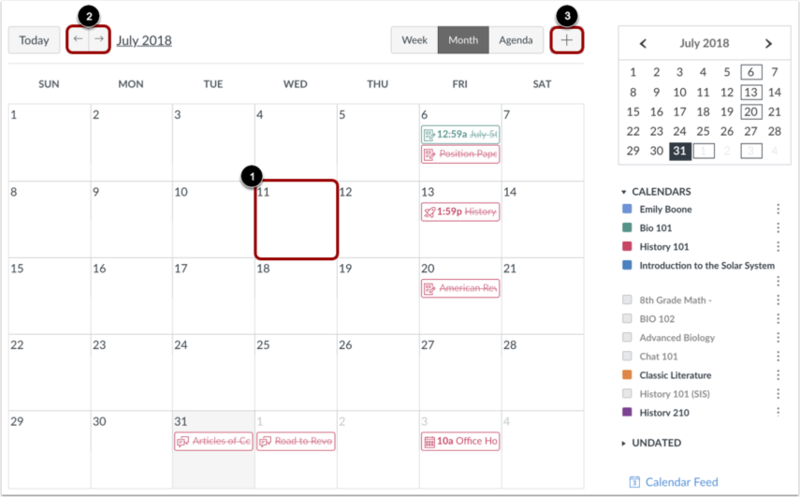 To select a course calendar for your To-Do item, click the Calendar drop-down menu . View your to-do item in the calendar. To edit or delete a to-do item, click the name of the item  and click the Edit button  or Delete button . Previous Topic:How do I add an event to my calendar as a student? Next Topic:How do I add and duplicate an event in the Calendar as a student? Table of Contents > Calendar > How do I add a to-do item in the Calendar as a student? Re: Can pages now appear in students' to-do lists?